Our clients have inquired as to the consequences of the termination of a martial relationship upon rights in a New York estate. The resolution to this issue depends upon whether the relationship was legally terminated through a divorce and whether the estate is being conducted as an administration or a probate proceeding. Many of us are familiar with those whose relationships end, but who do not legally end the relationship by applying for and obtaining a legally binding divorce decree. In some cases, one of the partners relocates and is estranged to such a degree that they are unable to be found. In order to complete the estate proceedings, private detectives may be needed to determine if the relocating spouse predeceased, making them unqualified to inherit, or to ensure that notice as required by the Surrogate’s Court is effectuated. In other cases, the parties have a cordial breakup and interact often. However, in either case, the spouse is entitled to inherit from the deceased party’s estate, unless a judgment of divorce was obtained during the lifetime of both parties. The Surrogate’s Court will often request a copy of the judgment of divorce, so it is important for parties to maintain such significant documents in an accessible location. In the instances when a divorce was not obtained, this blog post will analyze the distinctions between an administration and a probate proceeding. This blog has discussed in general terms an estate administration proceeding, which is appropriate when a person dies without a will (intestate). New York’s Estates Powers and Trusts Law provides that the spouse receives the entire estate if there are no children. If there are children, the spouse will still receive $50,000.00 plus one-half of the rest of the estate. Certainly, a separated person would not wish for his spouse to receive the bulk of his estate, but this would be the result in an administration proceeding. 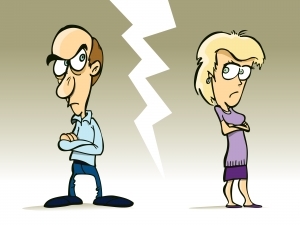 Should such a separated person not wish to divorce, he should have a will that is consistent with his wishes prepared by legal counsel in order to attempt to prevent this result. One should be mindful that in New York State, a spouse cannot be disinherited under most circumstances. A spouse has the right to her “elective share”, which is that amount that would have been inherited in the event of intestacy. An exception to this concept is obtaining a proper waiver of elective share document, wherein the party waives her right to her elective share in the spouse’s will. This document may be appropriate even when a relationship has not dissolved. For instance, one spouse may be independently wealthy and be willing to waive her elective share so that the children of the deceased receive the bulk of the estate. The waiving spouse may also be duly provided for by other assets such as life insurance. As we have demonstrated to our readers, the failure to legally terminate a relationship through divorce has tremendous legal consequences in the estate arena. A spouse could obtain the vast portion of one’s estate, even if not intended by the deceased spouse who failed to make a will and obtain a waiver of right of election. Our firm is available to discuss the intersection of your marital situation with your estate plan and will prepare the documents needed to implement your wishes.